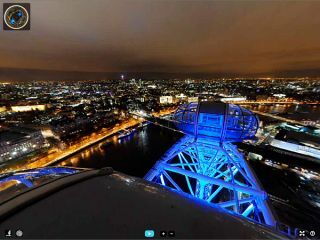 A 24 hour time-lapse 360 degree video has been shot from the top of the London Eye using three Nikon D700 DSLRs. Produced by Spherical Images, the video was shot using three Nikon D700 cameras back to back, later stitching the resulting images together using Kolor Autopano Giga software. The video, which is roughly 90 seconds long and comprises of a series of 3000 panoramic images, shows London transformed from day to night, and can be viewed on a special website which allows visitors to change the angle of view. According to Henry Stuart, Director of Spherical Images, it took 18 hours to process all of the images together into the panoramas. The video itself also proved problematic, "Each frame was nearly double the size of HD as a lot of what is being played is behind, above or below where you are looking," he told us. "It crashed the video editor's computer a few times." To create the panoramas that comprise the video, Stuart made a template to stitch from the first image and then applied the settings on all the images that followed. Each of the Nikon D700 cameras was fitted with a fish-eye lens in order to capture the widest amount of the scene possible. Shot during the London Eye's maintenance week, the video is available to view via the Spherical Images website as well as via Samsung Galaxy Tab 10.1 devices that have been installed in each of the London Eye capsules.